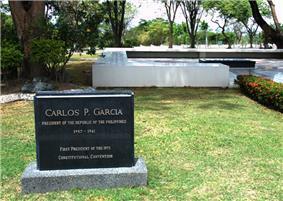 Carlos Polestico Garcia, commonly known as Carlos P. Garcia, (November 4, 1896 – June 14, 1971) was a eighth President of the Philippines. Garcia grew up with politics, with his father serving as a municipal mayor for four terms. He acquired his primary education in his native town Talibon, then took his secondary education in Cebu Provincial High School, both on top of his class. Initially, he pursued his college education at Silliman University in Dumaguete City, Negros Oriental, and later studied at the Philippine Law School where he earned his law degree in 1923. He was among the top ten in the bar examination. Garcia entered politics in 1925, scoring an impressive victory to become Representative of the Third District of Bohol. He was elected for another term in 1928 and served until 1931. He was elected Governor of Bohol in 1933, but served only until 1941 when he successfully ran for Senate, but he was unable to serve due to the Japanese occupation of the Philippines during the Second World War. He assumed the office when Congress re-convened in 1945 after Allied liberation and the end of the war. When he resumed duties as senator after the war, he was chosen Senate majority floor leader. The press consistently voted him as one of the most outstanding senators. Simultaneously, he occupied a position in the Nacionalista Party. Garcia refused to cooperate with the Japanese during the war. He did not surrender when he was placed on the wanted list with a price on his head. He instead took part in the guerilla activities and served as adviser in the free government organized in Bohol. As Secretary of Foreign Affairs, he opened formal reparation negotiations in an effort to end the nine-year technical state of war between Japan and the Philippines, leading to an agreement in April 1954. 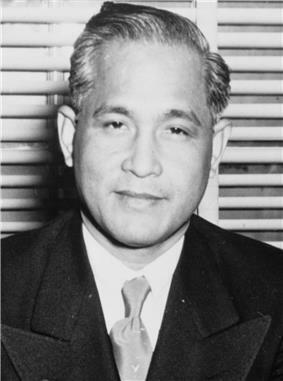 During the Geneva Conference of 1954 on Korean unification and other Asian problems, Garcia, as chairman of the Philippine delegation, attacked communist promises in Asia and defended the U.S. policy in the Far East. In a speech on May 7, 1954–the day that the Viet Minh defeated French forces at the Battle of Diên Biên Phu in Vietnam– Garcia repeated the Philippine stand for nationalism and opposition to Communism. ^ a b "Remembering Carlos P. Garcia on his 115th Birth Anniversary". Manila Bulletin. Retrieved 2012-10-05. ^ "President’s Month in Review: March 16 – March 31, 1958". Official Gazette of the Republic of the Philippines. On June 1, 1971, Garcia was elected delegate of the 1971 Constitutional Convention. The convention delegates elected him as the President of the Convention. However, just days after his election, on June 14, 1971, Garcia died from a fatal heart attack. 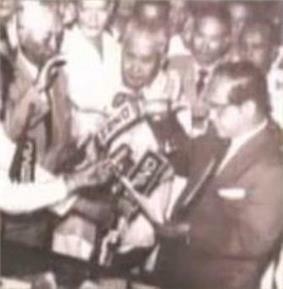 He was succeeded as president of the Convention by his former Vice-President, Diosdado Macapagal. The government would tightened up its controls to prevent abuses in the over shipment of exports under license and in under-pricing as well. Vice-President Carlos P. Garcia (right) was inaugurated President upon Magsaysay's death at the Council of State Room in the Executive Building of the Malacañan Palace complex. The oath of office was administered by Chief Justice Ricardo Paras.